To commemorate ten years since the death of Kurosawa Akira, Rikkyo University, which has recently developed a film studies program inside their College of Contemporary Psychology, held a symposium on July 12 at their campus in Shiki. The first half was devoted to a talk with Nogami Teruyo (Kurosawa's long-time scripter and later production manager) and Kurosawa Kazuko (his daughter and now a prominent costume designer for films such as Kitano's Zatoichi), with Maeda Hideki (dean of the College) and Shinozaki Makoto (director of Okaeri and now professor at Rikkyo) serving as questioners. The talk was quite congenial and it was nice to see Nogami-san after several years (she kindly gave us a gift when our son was born). Shinozaki-san also mentioned to me that he had just finished filming a 2-hour TV movie. I look forward to that. The second half was devoted to papers and discussion. Yomota Inuhiko talked about the problems of Kurosawa's last films while emphasizing the influence, especially in Asia, of The Seven Samurai. 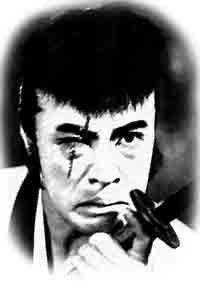 Hase Masato, who's translating my Taisho cinema book, tried to contrast the usual discussion of the free and dynamic body we are used to seeing through Mifune's acting in Kurosawa, by considering the restricted body in works like High and Low, especially how the two function in films of strategy where fakery plays a central role. Finally, Mitsuhiro Yoshimoto argued that the impossibility of showing the "awakening" of Watanabe or its inheritance in Ikiru can be seen as an allegory for the difficulty of considering the brilliance of Kurosawa or his legacy. 1) Remakes. Recently we have seen first Sanjuro and then Hidden Fortress remade. Putting aside whether these are good films or not, it is a shame that young people in Japan are not seeing the real Kurosawa, but rather imitations. As all the panelists said at the symposium, a few years ago, you could count on a few Japanese students in class having seen Seven Samurai, but now you can't. Maybe these remakes will spark a few people to seek out the originals, but with very little effort being put into film history education in Japan, there is no concerted effort there. 2) TV commercials, pachinko and other forms of licensing. Those of you in Japan might have noticed some recent TV commercials for a new pachinko game put out by the company Fields called CR Seven Samurai. Some of the commercials, which star Asano Tadanobu, redo scenes from Seven Samurai, sometimes shot for shot with amazing accuracy, to the Stones' "Satisfaction." Is that a satisfactory legacy? 3) Copyright. As I have reported on KineJapan, Kurosawa has been used by Toho to argue that films made before 1954, which should now be public domain according to current copyright law, are still under copyright if the director died after the law came into effect. Courts have already repeatedly declared films made before 1954 to be in the public domain and thus have okayed cut-rate DVD producers like Cosmo. Toho sued Cosmo for putting out cheap DVDs of Kurosawa's pre-1954 films by suing under the old copyright law, which technically still is in effect if the copyright lasts longer than under the new law (instituted in 1971). The old law states that films "with originality" are to be treated differently from those without originality. The latter is only protected for 10 years, but the former enjoys a longer period. The law states only that films "with originality" are treated in one of two ways: either copyright will be for 38 years after the death of the author or for 38 years after it was released in the case of works with corporate copyright. It does not make clear which is to be applied in which cases (I do not know court precedent in this regard). Toho, as well as all the other film companies, have long argued that the copyright resides in the corporation, and that in fact is how the new copyright law changed things: it eliminated the ability of individual authors in a studio production to claim copyright and made copyright reside in the company, thus "clearing up" the ambiguities of the old statutes at the expense of film directors et al. Toho also historically has been the studio that, forwarding the producer system, downgraded the role of the director. Toho however realized that its films before 1954 are in the public domain, and now argues that Kurosawa is now really the author of these films (and that Toho deserves to be paid for use of them). Toho won the first round in courts (which may open up a Pandora's box if the families of directors like Kinoshita, Imai, Taniguchi, etc. start insisting they have copyright and should be paid), but Cosmo is appealing. The effect of all this is not only an assault on public domain (I remember reading reporters in Kinema Junpo saying there is no reason public domain should exist), but also a further strengthening of the stranglehold of copyright. That was symbolized by the fact the symposium organizers declared at the start that the clips--and these were only clips--used at the symposium were cleared with Toho, Shochiku, etc. Such a procedure, if it was demanded by the companies, not only violates the academic right to quotation, which Japanese courts have confirmed in recent cases with other media like manga, but it establishes a dangerous precedent. Will scholars or teachers no longer be able to even show one minute from a Japanese film in class or in an academic talk unless they pay the company or get clearance (which might involve getting clearance on the content of the talk)? I again believe that excessive enforcement of copyright is one of the biggest threats to current Japanese film culture. Is that the legacy we want Kurosawa Akira, the Japanese film director who really belongs to the entire world, to have?